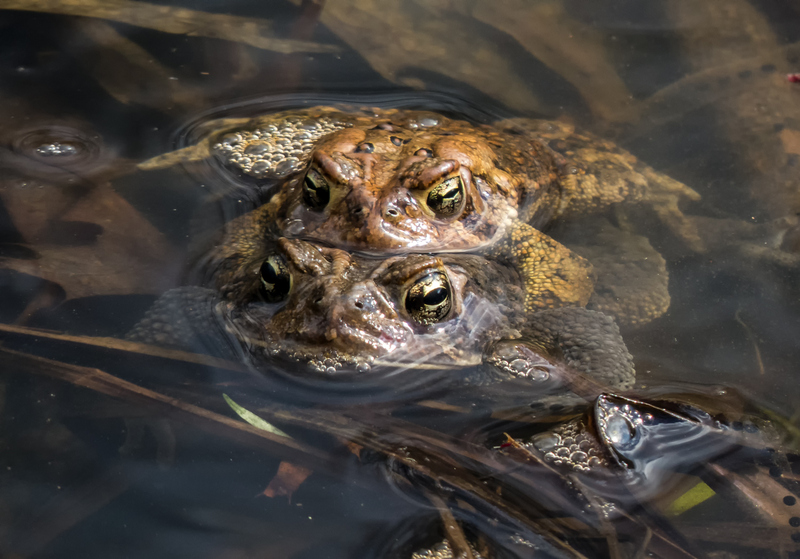 When you truly love someone, you love them warts and all (and as the second image shows, American Toads (Anaxyrus americanus) have lots of warts). I spotted these amorous amphibians earlier this week at Prince William Forest Park in Triangle, Virginia. Can you actually see a sound? 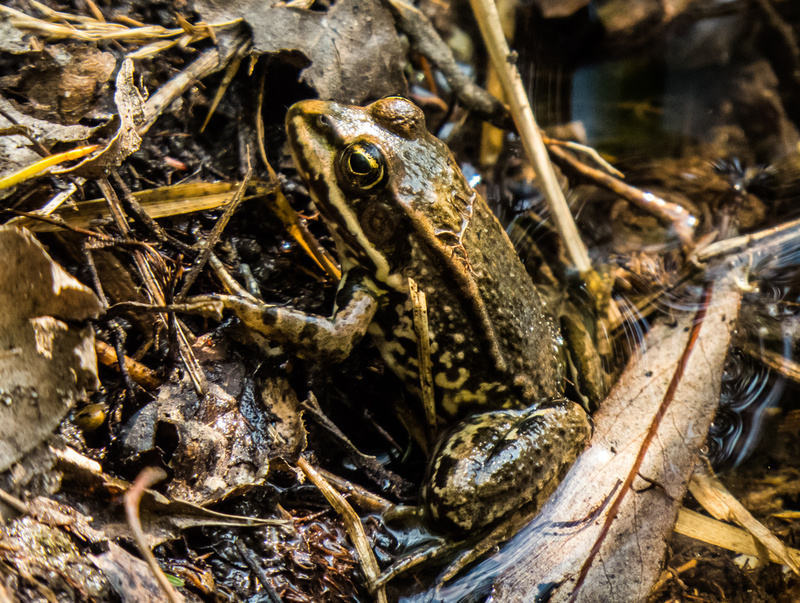 Yesterday while I was exploring Prince William Forest Park, I heard a whole lot of croaking. 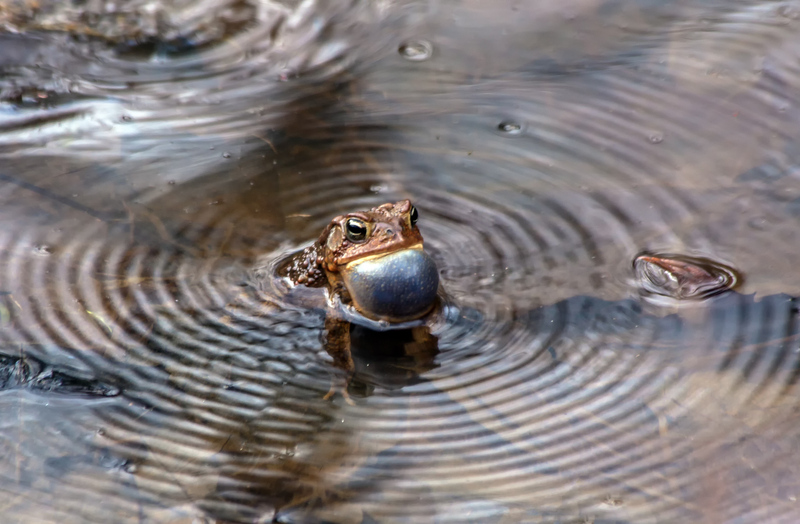 Eventually I spotted one really loud male toad with an inflated vocal sac, which was pretty cool. 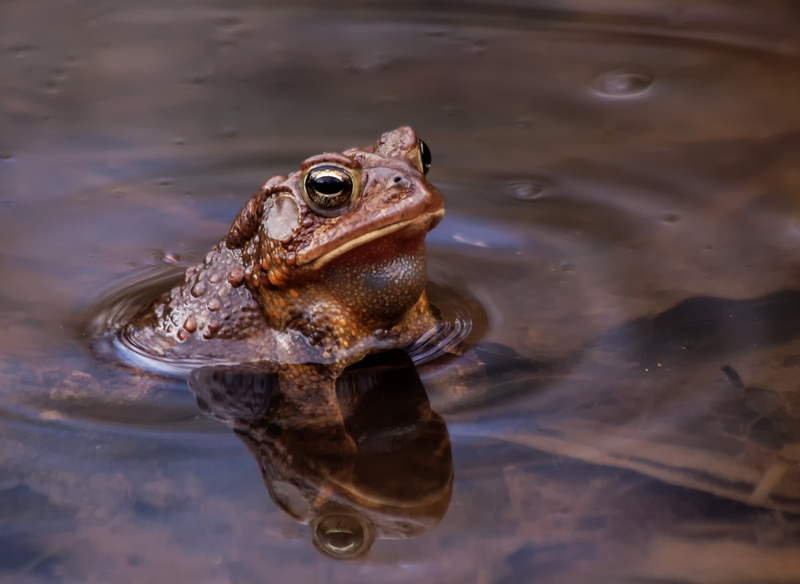 What were even cooler were the concentric ripples in the water generated by the toad’s croaking. The second image shows the toad resting in between performances, whose main purpose is to attract mates. His song did not appear to have had any immediate benefits, although I was certainly impressed. 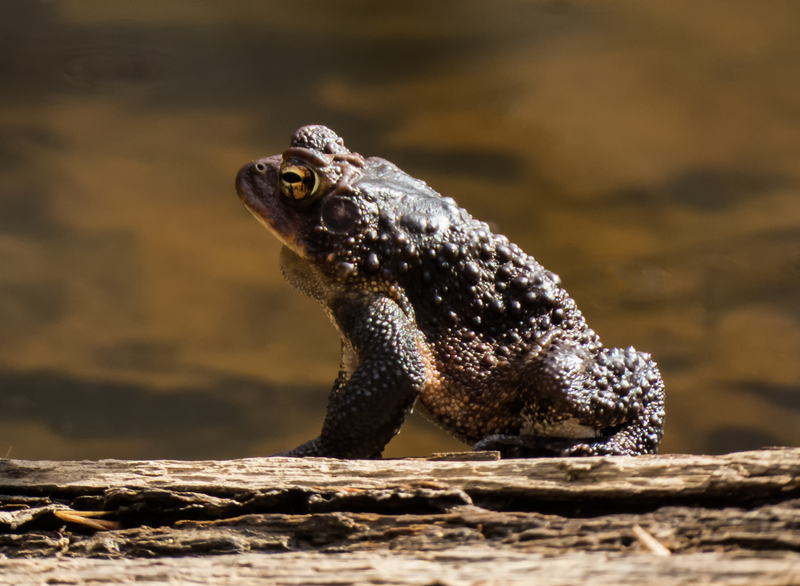 UPDATE: I initially identified this as a frog, but fellow blogger and wildlife enthusiast Walter Sanford pointed out to me that this is probably an American Toad (Anaxyrus americanus). 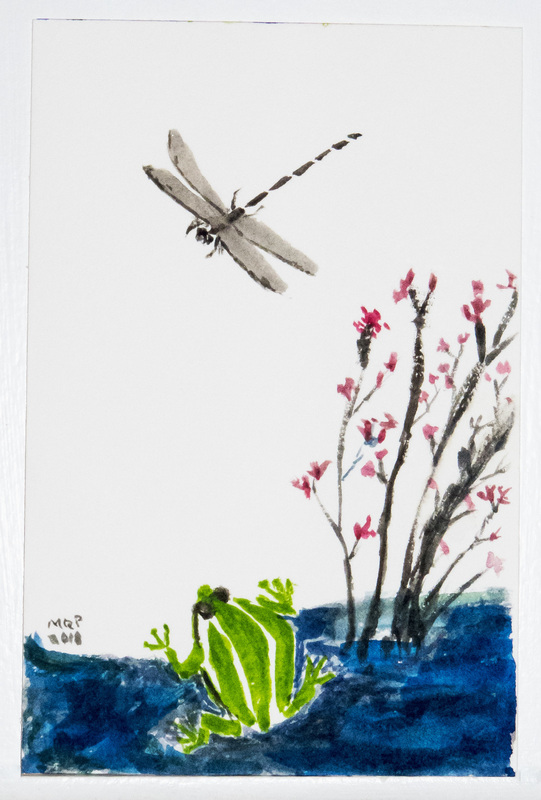 Last night I was playing again with watercolors and found inspiration in some videos about Chinese sumi-e brush painting, particularly one by Daleflix on YouTube that showed him painting a dragonfly and a frog. I really like the way that sumi-e painting, which is often done in ink on rice paper, emphasizes the importance of each brush stroke. My painting skills still need a lot of work, but I especially like how the dragonfly turned out. There is a kind of minimalism in the dragonfly that appeals to me. It was really all-or-nothing when I painted it. Each of the wings, for example, was a single brush stroke, with a little bit of outlining done later. Similarly, the segmented body was done in a single pass. I kind of got a little lost after I had painted the frog and the dragonfly and tried to add some contextual elements. The water ended up way too dark and some of the branches got too thick. In case you are curious, the painting is 4 x 6 inches in size (10 x 15 cm), so the brush strokes were pretty small. Still, I like the overall feel of this little painting, which represents a new step for me as I explore watercolors. I think that I may explore this style of painting some more. Do you think about your photographic subjects one at a time? That’s the way that I tend to operate. One of my blogging friends, though, likes to organize photos of others around themes that transcend the boundaries of individual species. In this posting, Liz of Exploring Colour focused on the theme of Predators and Prey with photos that capture this reality of nature without becoming gruesome. Be sure to check out her other wonderful postings too that include her own photos as well of those of some other awesome photographers. The reality of the natural world is that some creatures eat other creatures to survive. 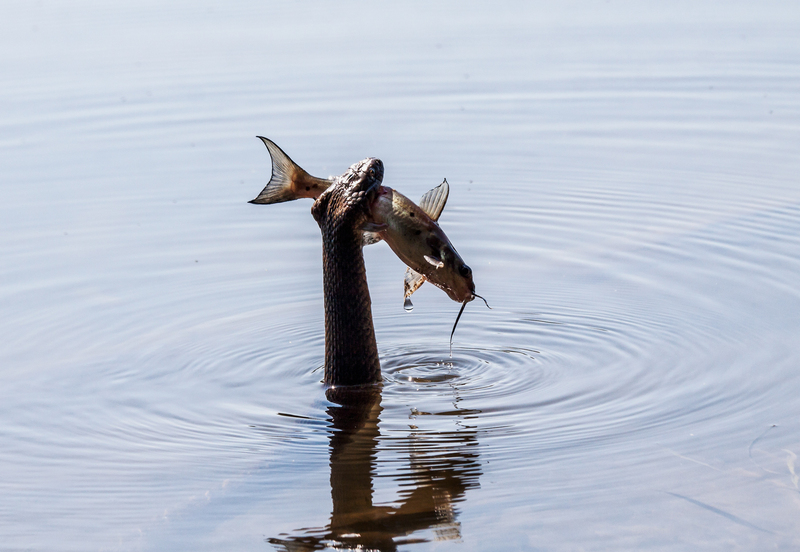 Nature photographers spend a lot of time outside and sometimes capture dramatic moments in the struggle for survival. Their photos and stories may shock us but we can learn so much from these encounters – animals seem capable of much more planning, strategy and applied knowledge than what most of us humans ever give them credit for. Note: Each photographer’s website/blog is listed at the bottom of this blog-post. I will be heading home soon after my brief stay in Vienna, Austria and thought I would post a few last wildlife photos that I took here. These images help reinforce to me the notion that there is always something interesting in nature to photograph, no matter where I happen to be. The first image is an unidentified species of frog that I encountered at the edge of a pond while wandering about the Donau-Auen National Park. It reminds me of the Southern Leopard Frog that I often see at home in Northern Virginia. 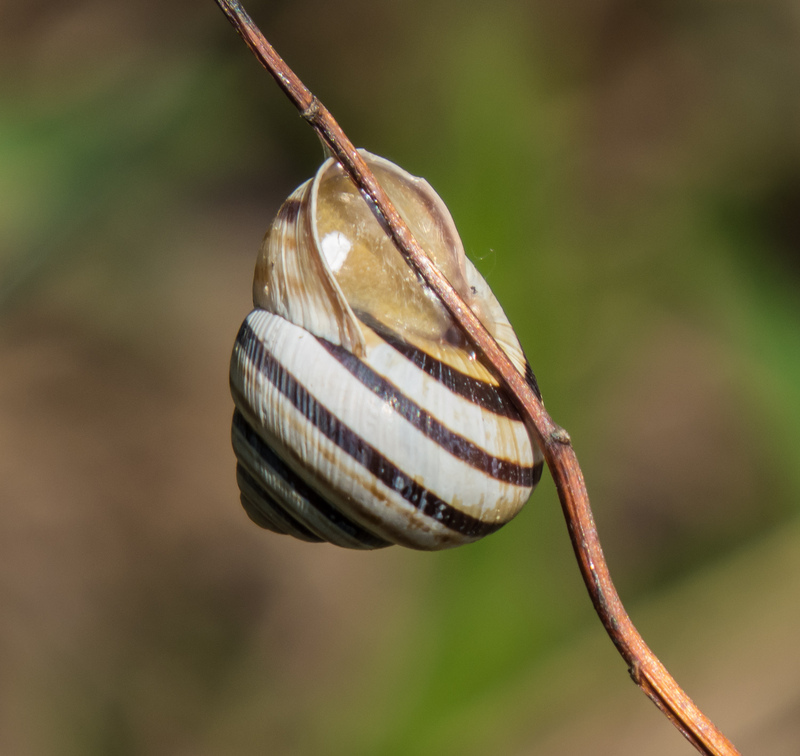 The second image appears to be a Viennese Banded Snail (Cepaea vindobonensis) that I also spotted in the National Park. I thought that it was really cool the way that it had attached itself to the vegetation. 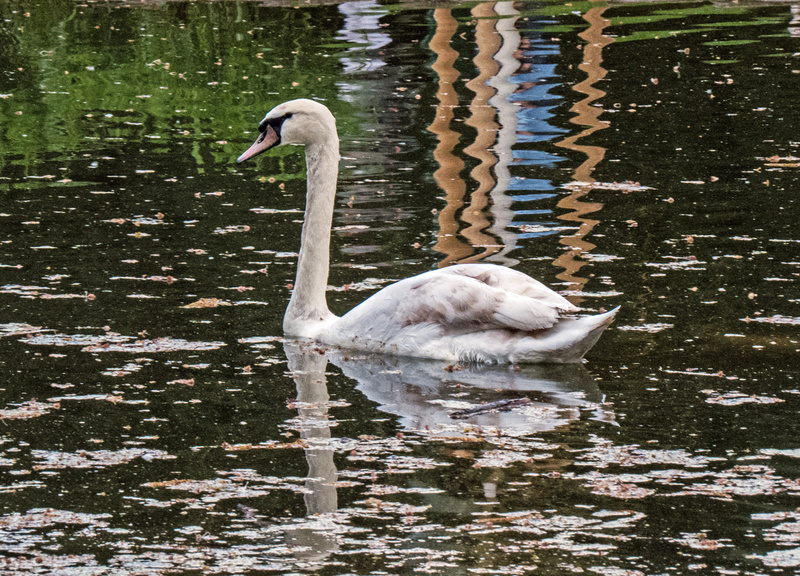 The final image shows what I believe to be a Mute Swan (Cygnus olor) that I saw at the Stadtpark (“city park”) not far from the hotel where I am staying. I always find swans to be beautiful and graceful, even when located in an urban environment. The bright blue color of a juvenile skink’s tail is so startling and whimsical that I never fail to smile whenever I see one. When I first spotted this Common Five-lined Skink (Plestiodon fasciatus), it was basking in the sun on top of a concrete fishing platform at Jackson Miles Abbott Wetland Refuge. As I approach, it scurried under the platform and I stopped and waited. 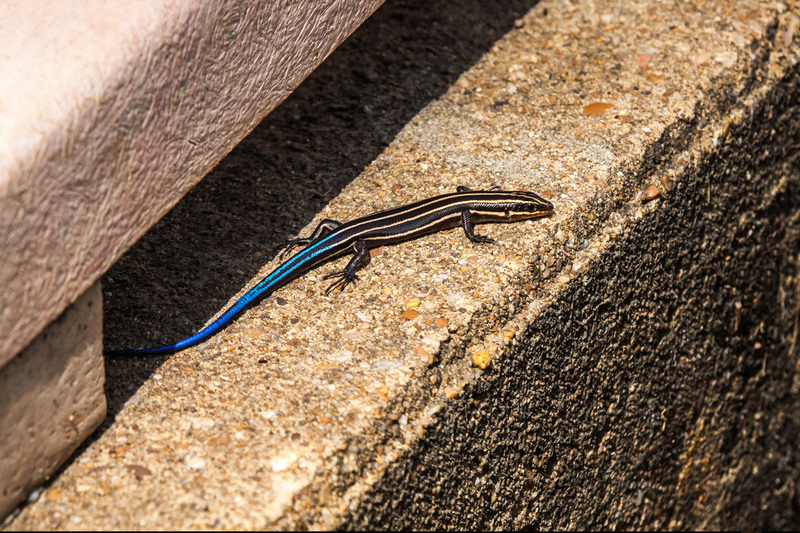 Eventually the skink poked its head out and cautiously crawled forward and I was able to capture this image. Generally I prefer a more natural backdrop for my shots of insects and amphibians, but in this case I really like the varied colors and textures of the man-made materials. I also like the angular lines that contrast nicely with the curves of the skink’s body. Finally the neutral colors of the image help to draw the viewer’s eyes to the beautiful blue tail. As I was walking along the Potomac River one day last month, I came upon this large toad, which I think might be a Fowler’s Toad (Anaxyrus fowleri). 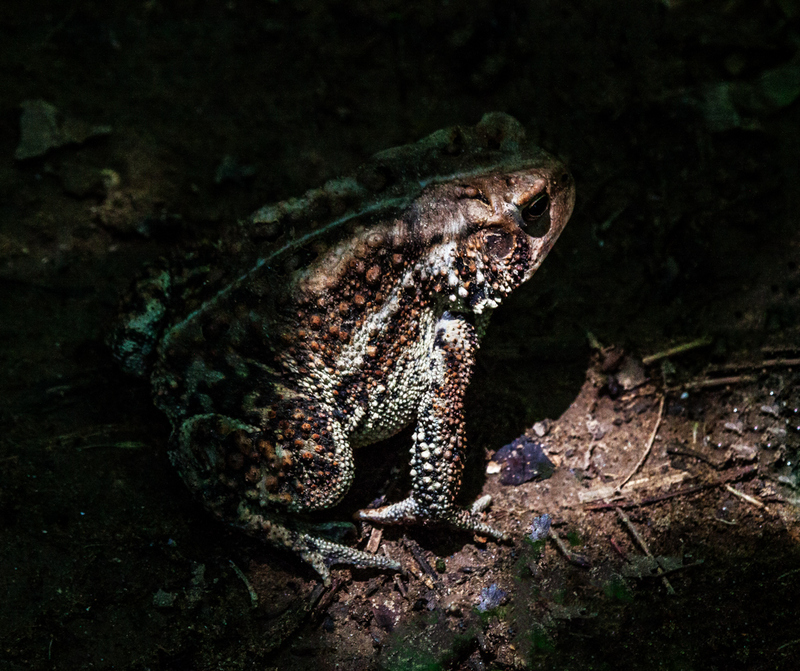 I was really struck by the way that the light and shadows helped to emphasize the very bumpy texture of the toad’s skin.